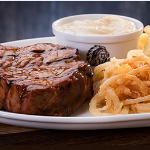 Malibu Bay Spur Steak Ranch is a family style restaurant with a taste for life! South Africa’s favourite burgers, ribs and steaks. Excellent food and ambience . Loved it will certainly be back soon .